In total, 661 patients have been examined in inpatient clinics; of these, 234 subjects are aged 60 to 102 years and 427 subjects are aged 18 to 59 years. The variants of pathologies that distinctly increase in prevalence with age are identified. First and foremost, these are pathologies of the locomotor system, gastrointestinal tract, and cardiovascular system. Conversely, cerebrovascular accidents (strokes) are prevalent in subjects under 60 years old, while the incidence of CAD and angina pectoris without the development of myocardial infarction in elderly and senile subjects insignificantly increases as compared to subjects under 60 years. The specific clinical and etiological features of senile asthenia (as an independent disease) and age-related cognitive disorders are identified as compared with the classical asthenic and cognitive disorders that develop in young and middle-aged subjects. 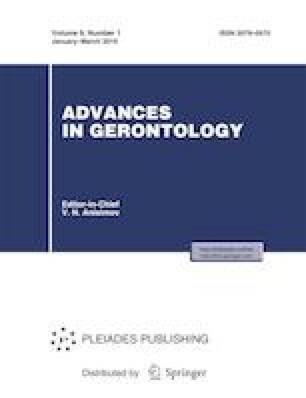 This necessitates the need for specially trained geriatricians to diagnose and treat patients over the age of 60 with a comprehensive geriatric assessment of the patient’s state. It is desirable to reinforce the staff of the geriatric inpatient clinics with neurologists and psychiatrists with priority given to diagnosis and treatment rather than the prevalence of palliative care.